Mormons likened their exodus from Nauvoo to ancient Israel fleeing from a hostile land into the wilderness. And like ancient Israel, they looked to the word of their God for sustenance. "I will even make a way in the wilderness, and rivers in the desert," Isaiah wrote, "because I give waters in the wilderness, and rivers in the desert, to give drink to my people, my chosen." Before leaving Nauvoo Brigham Young and other Mormons had read about or heard reports from government explorers and mountain men about the arid conditions found in the Great Basin. Upon their arrival in the Great Salt Lake Valley, members of the first company quickly set about to turn the desert into a productive land just as ancient Israel had done in their own promised land. A small irrigation ditch was dug to divert water from City Creek to the sunbaked and hardened soil. The Mormons' long struggle to make the desert blossom as the rose is an epoch-making account in history of the American West. The Mormons' development of irrigation was not, however, the first such attempt to irrigate land in western North America. Long before the discovery of the New World by Europeans, Indians of the American Southwest diverted water to their crops. In the 1760s Spanish settlers at the mission of San Diego constructed canals to irrigate their crops. Several years prior to the arrival of the Mormon Saints at the Great Salt Lake Valley, some of the first American settlers in Oregon had dug small ditches to water their crops. And, contemporary with the Mormon settlement of the Great Salt Lake Valley, Indians in southern Utah were raising crops with the aid of irrigation. Parley P. Pratt while on an expedition to southern Utah commented on the use of irrigation ditches by Indians living along the Santa Clara River. The flows and gradients of nearby mountain streams coupled with soil conditions and the amount of local annual precipitation influenced the location, size, and eventual success of many early Utah settlements. These factors also influenced the amount of land colonizers farmed. To build large irrigation canals required large pools of human and financial resources. Recognizing this, Brigham Young urged farmers "to raise (their) sustenance from smaller quantities of land" than what they had been accustomed to in the more humid regions of the east. The success of building Zion rested squarely on communal cooperative efforts and the individual discipline of irrigators to use beneficially the limited water available to them. The irrigation canal was the first and most important public utility in Utah. During pioneer times, at one of the first public meetings held in a valley a watermaster was appointed to oversee the distribution of water. Today, in many Utah communities the watermaster is still highly respected. The development of irrigation in Utah is divided into several distinct phases. During the first phase, which ends in the 1880s, small irrigation works were constructed at the mouths of canyons where there were perennial flows of water. These early canals had small carrying capacities and extended only short distances along the lower foothills of the valleys of the Great Basin. They were simple in design and construction. Stovepipes or similar devices, and bottles or pans filled with water were used to determine the location and appropriate grades for the canals. Horses or oxen pulling A-shaped wooden frames and slip scrapers were used to dig shallow ditches. Men followed, using picks and shovels to complete the work. Diversion dams at the head of the ditches were constructed out of available building materials including rock, straw, logs, and dirt. Because of their often poor design and construction materials, diversion dams had to be constantly rebuilt or replaced. Work assessments for constructing canals and later for annual canal maintenance were frequently made by the local bishop from the pulpit of the local ward meetinghouse. Farmers in the northern settlements of Utah early on were generally more successful at irrigating their crops than were farmers living in southern Utah. Their success was due in large measure to the lay of the land, the soil conditions, and greater precipitation in the form of snow. Irrigators of southern Utah faced greater difficulties in their attempts to coax water onto their land. Often the soil of southern Utah was too sandy to hold water effectively in the shallow canals, or the land was either hardpan or slickrock covered with little vegetation and thus unable to hold back much of the rushing waters from sudden and often violent summer thunderstorms. Washed-out irrigation ditches and broken diversion dams were regular occurrences in southern Utah. In addition, many streams in southern Utah flow intermittently, resulting in irregular or missed water turns of irrigators during critical periods of the irrigation season. During this early period of irrigation development the basic principles of water law as well as irrigation traditions and customs were established. Utah irrigators soon abandoned the long-cherished eastern convention of riparian water rights for the doctrine of prior appropriation and beneficial use. Riparian water rights state that streams cannot be diminished in size because of diversion or consumptive use. The doctrine of prior appropriation was founded on a combination of the ideas of individual stewardship, public ownership, and beneficial use, coupled with the fact of the lack of water. Water rights in Utah are granted to individuals for beneficial use only. For the first few years, local bishops distributed water based on their appraisal of the worthiness of the individual irrigator. In 1852 the territorial legislature granted authority to the county courts (a probate judge and three selectmen, who were appointed) to control and distribute the use of water and other natural resources within their jurisdiction. Irrigators then petitioned the courts for the use of the water. If the irrigator failed to use the water beneficially or abandoned its use, the county court reclaimed the water right for the public. In 1865 the territorial legislature granted individual irrigators the authority to organize themselves into irrigation districts. Districts then had the power to levy water or canal assessments on their members for the operation and maintenance of their canals. Two years later, irrigation districts were granted the power to form irrigation companies. The second phase of irrigation development began in the 1880s. Increased federal legislation aimed at eradicating the practice of polygamy from the territory and severing the strong church-state bond also influenced the development of water law in Utah. In 1880 the territorial legislature granted to the now elected county selectmen the power to adjudicate water disputes. Furthermore, water was given to anyone wanting water for beneficial purposes. And, under the 1880 water law, irrigation rights became personal property and appurtenant to the land. It was during this period that farmers turned their attention away from building Zion based on small self-sufficient farms to improving their own economic conditions based on larger and more productive agricultural units. The size and number of farms grew dramatically during the last two decades of the nineteenth century, and a second generation of canals was needed. These newer canals were generally situated higher up on the foothills, and were longer, deeper, and had larger carrying capacities. Construction of these canals required larger sums of capital, which generally were not available in the territory. Some irrigation companies turned to the federal government for assistance. While federal aid to most irrigators did not come until the passage of the Carey Act in 1894 and the Reclamation Act of 1902, some federal support for Indian irrigation projects did trickle down during the late 1880s and 1890s to various Indian reservations in the West, including the Uintah Indian Reservation in eastern Utah. Unable to secure federal aid, some irrigation companies turned to private eastern capital for financial assistance. Irrigation schemes often were hastily planned, quickly blossomed on paper, but dried up just as quickly when it came to constructing the canals, leaving many irrigators high and dry. Still other farmers looked elsewhere for "new" sources of water. In Wasatch and Sanpete counties, for instance, farmers constructed two transmontane tunnels and diversion canals to divert water from the Colorado River drainage system to the Great Basin drainage system. These two irrigation projects without any outside help preceded the Strawberry Reservoir project by a decade and the Central Utah Project by more than fifty years. The turn of the century marked a new era for irrigation in the state. Following the first national irrigation congress, held in Salt Lake City in 1891, Utah irrigators, government officials, and civic leaders recognized that Utah's irrigation laws and management of water policies were outdated and that new laws and policies were needed. Shortly after statehood was attained in 1896, the state legislature established the office of state engineer. At first the state engineer's water responsibilities were limited, but during the first decade of the twentieth century his duties and authority for managing water resources were greatly expanded. It was during the first decade of the twentieth century that irrigated lands increased by 132 percent, the largest percentage increase in the state's history. New irrigation systems were built or older ones expanded or rehabilitated to meet the increased needs of newly established farms. Following the opening of the Uintah Indian Reservation to homesteaders in 1905, an extensive irrigation system was built in that area. Farmers in Utah Valley also took advantage of the opening of the reservation and the newly created federal reclamation program to win support for the Strawberry project. Jewish farmers from the east were enticed to take up virgin lands in Sanpete County. Some state support was provided to them, but their efforts at irrigating the land met with little success and their project, Clarion, was soon abandoned. Many other state-supported irrigation projects, however, did meet with some measure of success. At the turn of the century, the politics of water and the need for irrigation in the West drew national political attention. Political parties adopted planks in their campaign platforms supporting western reclamation endeavors. Regionally, the development of the Strawberry Reservoir in Utah and other irrigation projects in the Colorado River Drainage Basin brought to a head competing water claims upon the Colorado River by Colorado River Basin states and Mexico. On 24 November 1922, following months of debate and discussion, the Colorado River Compact was signed by the Colorado River Basin states. The compact divided the waters of the Colorado River between the upper and lower basin states and Mexico, and it marked the beginning of yet another era in the development of irrigation in Utah as well as in the West. The Upper Colorado Basin states signed the Upper Basin Compact in 1948. It divided Colorado River water among the Upper Basin States of Wyoming, Colorado, Utah, New Mexico, and Arizona. New reclamation and irrigation projects in Utah were stimulated by these two water compacts. In 1924, Weber County farmers entered into an agreement with the Bureau of Reclamation to develop further the Weber River. The Weber River Project was the first in the country to serve as an entirely multipurpose project, including recreation, municipal and industrial use, fish and wildlife, flood control, and irrigation programs. Other federally funded projects followed, including Echo Park Dam, which was later substituted by Flaming Gorge, and Glen Canyon Dam. 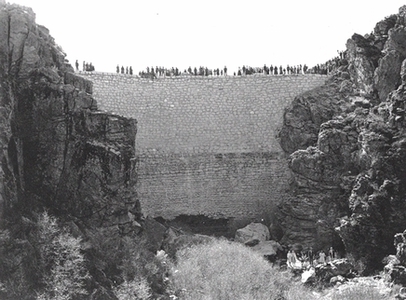 During the 1930s the Civilian Conservation Corps was involved in Utah in the building of 91 large irrigation and flood control dams, 423 impoundments and diversion dams, and 309 smaller dams. These water improvements were in part a result of the continued demands of agriculture in the state. By the early 1930s Utah farms numbered about 30,000. The average size of Utah farms was also larger. With the completion nearing of the Central Utah Project, which will be the last large federally funded project in the state, irrigators and urban dwellers are turning their attention to improving water systems. While the open dirt ditch is still common, canals and ditches increasingly are being lined with cement to conserve water. Other irrigators are enclosing their irrigation canals and ditches with pipe. Large sprinkler systems powered by gravity or electrical motors are now widely used, and they are proving to be more efficient than the traditional method of flood irrigation. To conserve water, Utah farmers also are planting new strains of crops that require less water. The importance of water and the development of irrigation in Utah is recognized and honored in various ways. Water fountains, pools, and artificial lakes dot university and college campuses, industrial parks, the Salt Lake International Airport, Main Street of Salt Lake City, and the central plaza of the LDS Church Office Building block. The Hurricane Canal, the Mountain Dell Dam in Parley's Canyon, and the Indian irrigation system in the Uinta Basin are nationally recognized as important historic sites. The story of irrigation in Utah is the saga that began with the individual irrigator, shovel in hand, coaxing a trickle of water onto the dry land. The history of Utah is indeed inextricably linked to the development of irrigation. See: Lawrence B. Lee, Reclaiming the American West: An Historiography and Guide (1980); Kathryn L. MacKay, "The Strawberry Valley Reclamation Project and the Opening of the Uintah Indian Reservation," Utah Historical Quarterly 50 (1982); George Thomas, The Development of Institutions Under Irrigation: With Special Reference to Early Utah Conditions (1920); William E. Smythe, The Conquest of Arid America (1900); Levi Edgar Young, "Irrigation and Industry," Utah Historical Quarterly 14 (1946); Charles Hillman Brough, Irrigation in Utah (1898); Elwood Mead, Irrigation Institutions (1903); Leonard J. Arrington and Thomas G. Alexander, "The First Irrigation Reservoir in the United States: The Newton, Utah, Project," Utah Historical Quarterly 39 (1971); Leonard J. Arrington and Dean May, "A Different Mode of Life: Irrigation and Society in 19th Century Utah," Agricultural History 49 (1975); Wells A. Hutchins, Mutual Irrigation Companies in California and Utah (1936); George D. Clyde, "History of Wesley Powell, The Irrigation Survey, and the Inauguration of the Second Phase of Irrigation Development in Utah," Utah Historical Quarterly 37 (1969); A. J. Simmonds, "Water for the Big Range," Utah Historical Quarterly 39 (1971); LaVell Johnson, "The Watermaster's Stick," Utah Historical Quarterly 42 (1974); Gregory D. Kendrick, ed., Beyond the Wasatch: The History of Irrigation in the Uinta Basin and Upper Provo River Area of Utah (1989); Marc Reisner, Cadillac Desert (1986); and Donald Worster, Rivers of Empire: Water, Aridity & the Growth of the American West (1986).